Whether through full conversion to International Financial Reporting Standards (IFRS), or convergence between individual IFRS and US GAAP standards, US companies will be required to make significant changes to current reporting practices in the coming years. 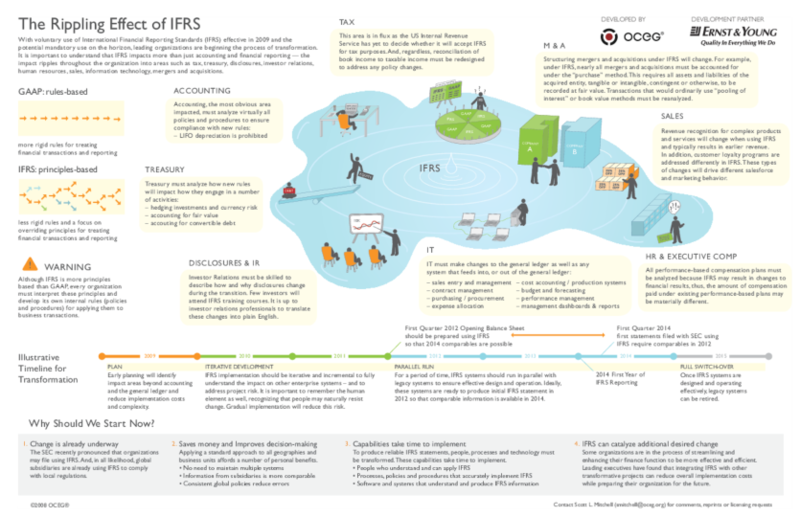 This illustration addresses how change in accounting and reporting has a ripple effect throughout the organization-impacting tax, treasury, regulatory, investor relations, human resources, sales, operations, information technology, legal, and business development. We have emailed instructions to access Illustration – The Ripple Effect Of IFRS to . Make sure the email arrives in your inbox: either add "support@oceg.org" as a safe sender to your email platform, or if you use Gmail, drag our email into your Primary tab.